Places emphasis on narrative in the fields of science, too. Postmodernism as "incredulity toward mata-narratives" (Introduction xxiv). Against Grand Narratives of legitimation; for small and local narratives. He sees the working of society as a network of language games (based on socio-linguistics, esp. the performance theory). Against consense; for paralogy. The postmodern sublime vs. the terror of totalization. 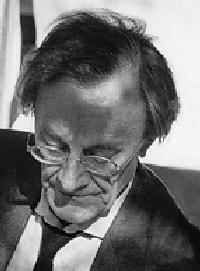 Jameson's response to the loss of the great master-narratives: he believes we should "[take] a further step that Lyotard seems unwilling to do in the present text, namely to posit, not the disappearance of the great master-narratives, but their passage underground as it were, their continuing but now unconscious effectivity as a way of "thinking about" and acting in our current situation. --"political unconscious"
"The question of social class, and in particular of the "proletariat" and its existence, is hopelessly confused when such arguments conflate the problem of a theoretical category of analysis (social class) with the empirical question about the mood or influence of workers in this or that society today (they are no longer revolutionary, bourgeoisified, etc.). Avant-gardist -- ". . .his commitment to cultural and formal innovation still valorizes culture and its powers in much the same spirit in which the Western avant-gardes has done so since the fin de siecle." What are at stake in this argument over consense and dissensus, grand narrative vs. small narrative? Is coginitive mapping a kind of grand narrative? In any kind of politics, is it really possible to stay with dissensus? If not, how do we reach consensus without excluding/suppressing others' opinion? If, as Jameson said, working class is a theorectical concept, "grand narratives" and "small narratives" are, too. How do we apply these theorectical concepts to the social-historical? Can we find any examples for them? Is there any contradiction between Lyotard ideas of postmodernism and postmodernity? Lyotard, Francois. The Postmodern Condition: A Report on Knowledge. Trans. Geoff Bennington, et al. Minneapolis: U of Minnesota P, 1984. ...their rules do not carry within themselves their own legitimation, but are the object of a contract, explicit or not between players (which is not to say that the players invent the rules). if there are no rules, there is no game. . .
3. Narrative of the Legitimation of Knowledge -- e.g. narrative of emancipation, narrative of Enlightenment. *Lyotard Auto-Differend Page (a technical experiment and theoretical allegory; makes extensive use of client-pull animation to create a universe of automatic page sequences organized around the philosophy of Lyotard; REQUIRES Netscape 1.1 or later to activate client-pull sequences; Netscape 1.2b3 or later recommended for best results with color backgrounds) (Alan Liu)-- fun to read!